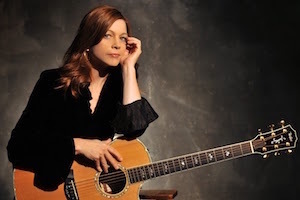 Folk singer-songwriter Carrie Newcomer will bring her intimate, introspective performance to Pepperdine University's Smothers Theatre on Sunday, January 21, at 7 PM. Pianist Gary Walters will join her on stage. Newcomer is known for interweaving her music with her contemplative Quaker faith. She has shared the stage with artists like Alison Krauss, and has collaborated with influential authors, scientists, and theologians like Parker J. Palmer, Jill Bolte Taylor, Philip Gulley, Scott Russell Sanders, Sandy Sasso, and Barbara Kingsolver. Both a performer and educator, Newcomer speaks and teaches about creativity, vocation, and activism at colleges, conventions, and retreats. She has appeared on programs such as public radio’s On Being with Krista Tippett and PBS’s Religion and Ethics Newsweekly, where she has discussed her use of creative the arts as a spiritual and mindfulness practice, her work in social and environmental justice, interfaith dialogue, progressive spirituality, and her efforts as a champion for a new political conversation. In 2009 and 2011 Newcomer was a cultural ambassador to India, invited by the American Embassy of India. In October 2011, she released her interfaith collaborative benefit album, Everything is Everywhere, with world master of the Indian Sarod, Amjad Ali Khan. In June 2012 she traveled to Kenya to perform in schools, hospitals, and spiritual communities. In 2013 Newcomer visited organizations dedicated to nonviolent conflict resolution through the arts and the empowerment of women in the Middle East. Huffington Post Religion Community listed her song, “Holy as the Day is Spent,” as one of the best spiritual songs of 2012. She was listed as one of “the 50 most influential folk musicians of the past 50 years” by Chicago’s WFMT. Boston’s WBEZ listed her as one of the most influential folk artists of the last 25 years. The musical artist has written two collections of essays and poetry as companion pieces to her most recent albums: A Permeable Life: Poems and Essays (2016), and The Beautiful Not Yet: Poems and Essays (2014). In 2016 Goshen College awarded her with an honorary degree of bachelor’s of music in social change. Newcomer’s first theatrical production, Betty’s Diner: The Musical, was produced as part of the Purdue University 2015/2016 theatrical season to rave reviews and a sold-out run. The music for Betty’s Diner: The Musical was written in collaboration with Richard K. Thomas and arranged by Gary Walters. Ticket prices range between $10 and $40, and are required for attendance. For additional information about the performance, and to purchase tickets, visit the Center for the Arts website.